Tree grates protect trees against severe urban surroundings that can make it difficult for trees to survive. They are ideal for integrating trees into hardened landscapes. They minimise the risks to pedestrians from open and uneven soiled areas and reduce the build up of debris at the tree base. When backfilled with coarse sand tree grates provide a level surface for pedestrians, as well as suppressing the growth of weeds. Tree grates reduce the volume of water flowing into stormwater drains because they direct rainwater into the subsoil. Trees along trafficked areas remain healthy because rainwater penetrates into the soil around the root zone. 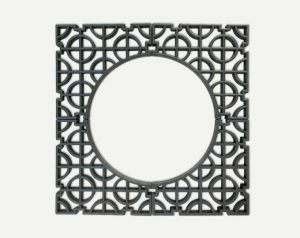 Made from a combination of HDPE, PP and fibreglass, tree grates can support up to 120MT/m2. They are available in various colours and UV treated for a long life (20 years). Installation is easy. They lock firmly together with clips and are easy to cut to fit around tree trunks. Joined modules remain in place after installation. High compressive strength (unfilled > 200 t/m²). Rapid installation with minimal operator training and tools. Reduced storage and transport costs.